Tackling pressing urban challenges requires engaging innovative youth for long-term sustainability. Photo by Ed Yourdon/Flickr. Given our increasingly complex and dynamic world, cities need to be continuously innovating in order to solve pressing social and environmental problems. Many cities worldwide are growing rapidly, and by 2050 it is estimated that 70 per cent of the world’s population will live in urban areas. This dramatic trend is greatly affecting natural resource availability—including access to clean drinking water—waste management, transport, and other aspects of modern cities. Furthermore, climate change is placing additional stress on urban environments. Increasingly extreme weather events, shifting resource availability, and rising sea levels are all testing the resilience of growing urban populations. Climate change presents a different challenge in every location—for example, in a small island nation, floods are a concern; in California, it’s drought. The combination of climate change and an increasingly urbanizing global population requires city officials, urban planners, and members of the private sector to find innovative approaches to efficient resource management, while simultaneously reducing greenhouse gas emissions and opening the door to new green technologies. 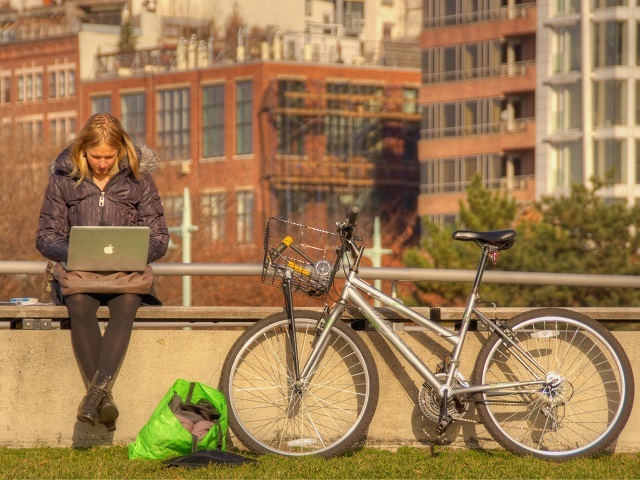 More than ever, we need young people involved in creating sustainable cities. This can be achieved by establishing and strengthening networks that provide opportunities for young aspiring entrepreneurs and innovators to get involved and learn from like-minded groups of individuals on a global scale. For example, the World Bank’s Connect4Climate program recently hosted a youth innovation contest called the Jakarta Urban Challenge. The aim of the event was to challenge students and entrepreneurs from Indonesia to find tangible solutions that improve mobility in Jakarta while simultaneously lowering GHG emissions. Jakarta is one of the most heavily congested cities and is the largest urban area in the world not to have a metro or subway system in place. It’s estimated that the local economy loses around $3 billion USD a year due to traffic congestion resulting from the city’s rapidly rising rate of vehicle ownership. The Jakarta Urban Challenge drew almost 250 submissions in just two months, with each entry offering a different approach to solving the issue. During an award ceremony last week, a panel of industry experts awarded the first place title to “Squee”—a mobile application that aims to unify pedestrians and cyclists to map the safest pathways around the city, encouraging more sustainable methods of transport. When used at a large scale, the app will encourage social interaction between pedestrians and, as a result, help form communities of travellers. The three finalists were awarded US $20,000 to help them develop their innovations. 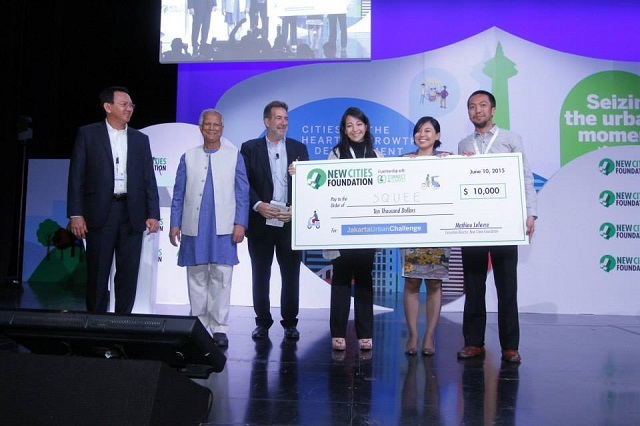 Members of the judging panel join the winning team (“Squee”) of the Jakarta Urban Challenge onstage. Photo by New Cities Foundation. Additionally, hackathons can foster collaboration by bringing together creative designers, experts, and developers to produce innovative solutions. One example is Code for Resilience—a series of hackathons organized by the World Bank and civil society organizations that engage young people to build urban resilience in Asia by “hacking”. Over 1,000 software and hardware developers participated in 11 hackathon events across nine countries. The events resulted in prototypes and tools that address a series of disaster resilience challenges discussed during community workshops. As simple as an app may seem, the collective effort required to develop these kinds of initiatives can help catalyse and leverage user-driven innovation on a larger scale. Similarly, the Mayor of London’s Low Carbon Entrepreneur competition challenges students to propose tangible ideas and concepts for lowering carbon emissions from buildings. A £20,000 development fund supports the winning proposals through implementation and provides finalists with training and mentorship. The challenge is now in its third year and has helped hundreds of students and recent graduates learn the basic principles of starting a business—giving students the opportunity to test their innovative ideas and produce real impact on the ground. “Urban challenges” are becoming powerful tools for crowdsourcing solutions from young people on a range of pressing issues—from urban resilience to energy efficiency. However, the missing link is connecting all these aspiring entrepreneurs and social innovators on a single platform where they can share experiences and knowledge, and collaborate with one another. One example of this kind of platform is Rockefeller Foundation’s 100 Resilient Cities initiative—a network that provides cities with resources for improving resilience to physical, social, and economic challenges. Although the 100 Resilient Cities program focuses exclusively on city governments, replicating this type of network for young innovators can be a powerful tool for scaling solutions from the bottom up. The Connect4climate program and others like it can help bridge that gap by creating an umbrella campaign for innovation, leveraging partners’ knowledge and experience to give opportunities for young innovators to turn their ideas into reality.